← Picture of the Week – Fullsteam Brewery! Counter Culture Coffee will be holding their weekly FREE coffee cupping at the training facility in Durham this Friday at 10am. The cuppings provide a great opportuntiy to learn more about the different flavors and profiles expressed by different coffee. The tasting is followed by a tour of the roastery. As an added bonus Counter Culture is kicking off their “Sustainable Spring” series and will have an iformation session about Beekeeping after the cupping and tour. Belly Up to The Cookery’s bar for is their second Public House Night this Saturday from 6-11pm! Sympathy for the Deli is roasting a pig and providing delicious dinner, and Iced Cupcakes will be serving sweet treats! The Duke vs. UNC basketball game will be shown on a 15 foot HD big screen. Great beer, wine and cocktails for sale at the bar. FREE ENTRY. The Spring Durham Food Truck Rodeo is this Sunday from 12-4pm. 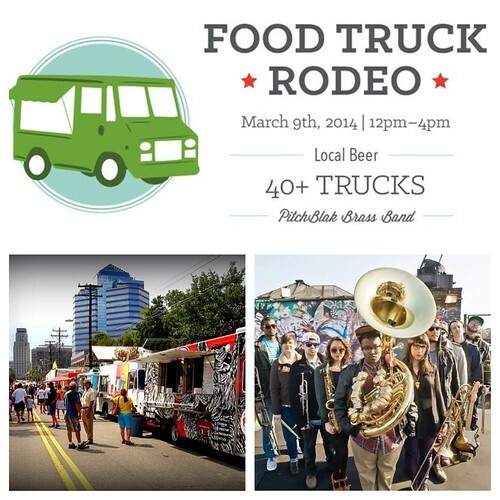 The rodeo will host over 40 Triangle Food Trucks. Local beer will also be available for sale. Musical Performance by PitchBlak Brass Band out of Brooklyn. The weather looks to be beautiful on Sunday and it is sure to be a great time. After the rodeo head down the street to two of my favorite spots: Cocoa Cinnamon for coffee and Fullsteam Brewery for more great beer!